Since the first radiopharmaceutical that was commercialized way back in 1950, Iodine-131 human serum albumin (RISA), the concept of nuclear medicine has been harnessed consistently over the past half a century. And, the future of the healthcare industry substantially depends on radiopharmaceuticals too, for both diagnostic and therapeutic applications. Radiopharmacology is useful several branches of medicine including cardiology, nephrology, oncology, gastroenterology, immunology, and neurology. As per the evaluations of this business intelligence study, the demand in the global radiopharmaceuticals market will increment at a steady CAGR of 5.4% during the forecast period of 2017 to 2024. 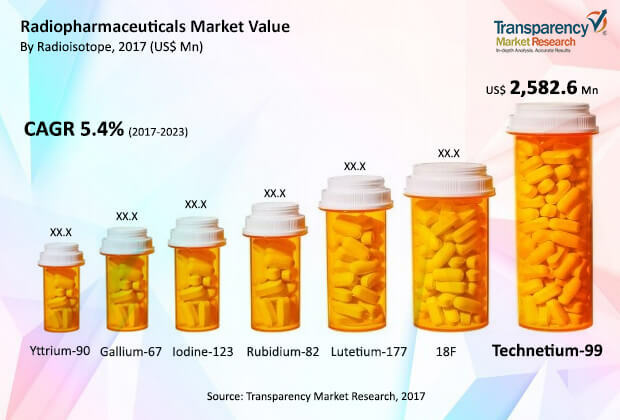 Revenue-wise, the global radiopharmaceuticals market is estimated to attain a value of US$7,430.8 million by 2024, mounting from its calculated worth of US$5,145.1 million as of 2017. On the other hand, the vastly populated region of Asia Pacific is foreseen to generate demand at a much stronger CAGR of 6.5% over the course of 2017 to 2024. However, this would reflect as only the third largest regional demand of pharmaceuticals worth of US$735.2 million, with Europe sustaining its second position despite a sluggish growth rate. GE Healthcare and Siemens Healthineers have been identified as the leading two companies holding major shares in the global radiopharmaceuticals market. This report on the radiopharmaceutical market analyzes the current and future scenario of the global market. Increase in incidence of various diseases, development of new sources for radioisotope production, and rise in demand for nuclear medicine are boosting the radiopharmaceutical market. Increase in incidence of cancer and cardiovascular diseases, growth in awareness about effective use of radiopharmaceuticals, and rise in preference for SPECT and PET scans are some of the factors expected to drive the growth of the global radiopharmaceutical market during the forecast period. The radiopharmaceutical market report comprises an elaborate executive summary, which includes market snapshot that provides information about various segments. It also provides information and data analysis of the global market with respect to the segments based on radioisotopes, source, end-user, and geography. A detailed qualitative analysis of drivers and restraints, and opportunities has been provided in the market overview section. Additionally, the section comprises Porters Five Forces Analysis to help understand the competitive landscape in the market. This section also provides market attractiveness analysis in terms of geography and market share analysis by key players, thus presenting a thorough analysis of the overall competitive scenario in the global radiopharmaceutical market. Based on radioisotope, the market has been segmented into Technetium-99, Lutetium-177, Rubidium-87, Iodine-123, Yttrium-90, and Gallium-62. Technetium-99 is the most widely used radioisotope across the globe; around 70% of radiopharmaceutical companies depend on Mo-99 to produce Technetium-99, as per the World Nuclear Association. The market segments have been analyzed based on available approved products, cost-effectiveness, and preference for technological systems by physicians and patients. The market size and forecast for each of these segments have been provided for the period from 2014 to 2024, along with their respective CAGRs for the forecast period from 2017 to 2024, considering 2016 as the base year. Based on source, the radiopharmaceutical market has been segmented into two major categories: nuclear reactors and cyclotrons. The market segments have been extensively analyzed based on increase in demand for radioisotopes for nuclear medicines, availability of radioisotopes and raw materials, radioisotopes short half-life and number of production units used for production of radioisotopes. Different types of end-user utilize radiopharmaceutical products to treat diseases either through imaging techniques or the therapeutics method. Under the end-user segment, hospitals plays a major role followed by ambulatory surgical centers, diagnostic centers, and others (such as universities, research laboratories, and pathology labs). The market size and forecast in terms of US$ Mn for each segment have been provided for the period from 2014 to 2024. The report also provides the compound annual growth rate (CAGR %) for each market segment for the forecast period from 2017 to 2024, considering 2016 as the base year. Application segment signifies the usage of radiopharmaceutical products through different disease indication such as oncology, cardiology, neurology, nephrology, gastroenterology, immunology and others. Oncology segment is the dominant sector which emphasizes the use of different radioisotopes for treating various cancers and overcome the side effects of therapeutics. Brachytherapy is a sub segment of oncology application which signifies the methods of treating cancer through implants, surgery or radiation technology. The segment is expected to have a significant growth during the forecast period. Geographically, the global radiopharmaceutical market has been categorized into five major regions and the key countries in the respective region: North America (the U.S. and Canada), Europe (the U.K., Germany, France, Spain, Italy, and Rest of Europe), Asia Pacific (India, Japan, China, Australia, and Rest of Asia Pacific), Latin America (Brazil, Mexico, and Rest of Latin America) and Middle East & Africa (South Africa, Saudi Arabia, and Rest of Middle East & Africa). The market size and forecast for each of these regions and the mentioned countries have been provided for the period from 2014 to 2024, along with their respective CAGRs for the forecast period from 2017 to 2024, considering 2016 as the base year. The report also profiles major players in the global radiopharmaceutical market based on various attributes such as company overview, financial overview, product portfolio, business strategies, SWOT analysis, and recent developments. Major players profiled in this report include Advanced Accelerator Applications (AAA), Eckert & Ziegler, GE Healthcare, IBA Radiopharma Solutions, Lantheus Holdings, Inc., Mallinckrodt PLC, Nordion, Inc., Siemens Healthineers, and Positron Corporation.